This week we are exploring the contrast between black and white. We have been drawing on white paper with black pens of differing thicknesses and today the children were presented with an invitation to explore this contrast even further using play dough. 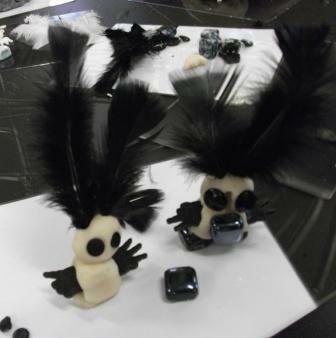 The table was covered with a black tablecloth and on it was placed laminated black and white cards with feathers, smooth glass beads, buttons and shapes and the playdough. 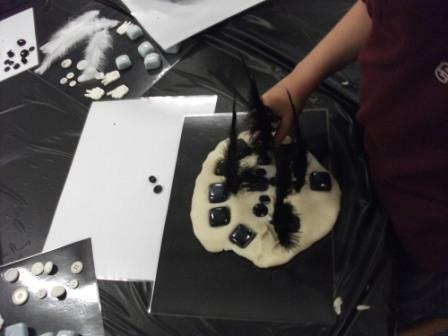 Unfortunately the black food colouring we used, made the playdough grey, not black, but the children were still drawn to it as we had made grey paint the day before for another project. 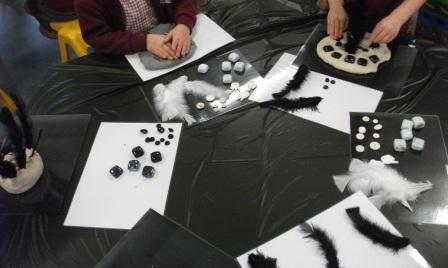 It was interesting to observe the children exploring the colour contrast between the dough and the materials. 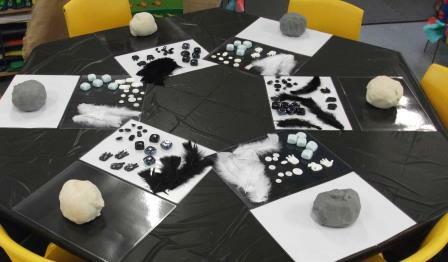 The photos with the black/grey playdough look they are black and white but are in fact colour. 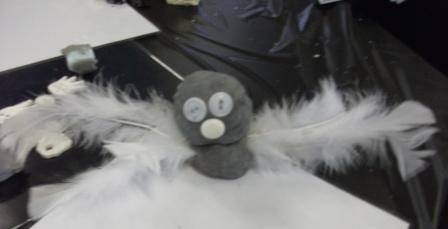 Some children made familiar things such as birds because of the feathers. The back view of these birds. Some of their other creations. 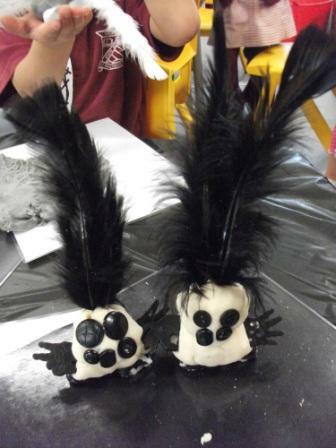 When I first reflected upon this experience, I was a little disappointed that I had offered the feathers because the children used them to make birds but after thinking about this some more, my intention was still successful. 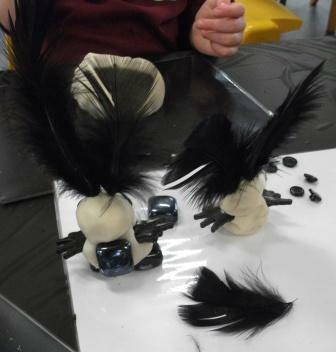 The children were very involved in using the contrasting black and white materials and whilst my planning was all about the process, I also had some preconceived ideas about the product which fortunately I did not try to impose upon them. This further reflection reminded me that the process was what was really important and …….. that there are a lot of black/grey and white birds in the world including the young magpie that regularly visits inside the classroom and that prior knowledge can be a powerful tool for learning. Curious…What would you do differently… Would love to know before I try this. I was thinking that this would be fun for Halloween, making ghosts. Hello and welcome! 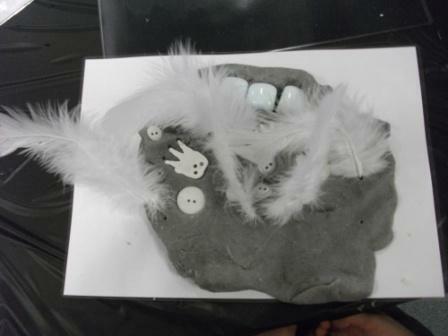 The invitation was put out again today and it was interesting to observe that the children used the materials differently today, particularly the feathers. 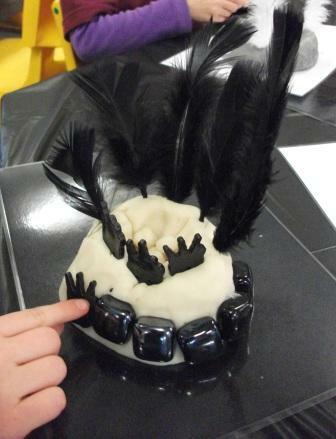 I think this is because they had in the past, at Kindy, used feathers to make birds and when they realised that in Prep, they were free to use these anyway they liked, the children explored other uses for them ie. they started with their prior knowledge and understandings and when no limits were placed on their exploration their imagination began to take over and new possibilities were explored. This is a great activity and I was keen to try it in my classroom. I asked one of my Mum’s to have a go making ‘black playdough’ (She has a cake business so I hoped that her expertise might problem solve the ‘grey playdough’ issue). She turned up yesterday with a container of awsome licorice looking playdough! Her secret ingredient is cocoa. 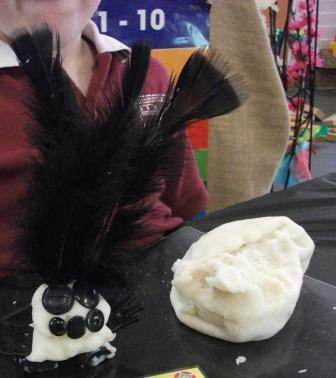 She used the cocoa to colour the playdough brown and then added the black food colouring after that. She said that the playdough required a bit of kneading to blend the colours, but the end result is gorgeous!